Earth Day, celebrated on the 22nd day of April, is one of those days when the Environmental Officers scramble about to organize different activities celebrating the occasion. I wanted to have a lot of activities but a single day wouldn’t be enough to accommodate them all. Hence, I decided to have an extended Earth Day celebration at Apulit Island Resort, with the activities spread out over three days. A picture is worth a thousand words. In that case, how many more words can a movie give? A good movie can be powerful enough to inspire and move people’s hearts. Wouldn’t it be nice to move all those hearts for nature? BBC The Human Planet is a documentary series on how people survive in the most extreme places on Earth. It shows the delicate relationships between people and the natural environment. I figured that this would be the perfect movie marathon to heighten people’s appreciation for nature. We made a really nice and comfy beach theater with throw pillows and mats laid on the sand. The videos were so amazing, they really take your breath away. I’d never get tired of watching them. They make you feel so good to be alive and integrally part of the Earth. Run (for the) Forest, run! We started our day with “Earth Run”, a fun run for environmental awareness. It was cloudy and chilly (and it’s hard to get up at 5:30 in the morning) but a good jog is always a nice way to energize your day. We had a small running group of eight. I led the pack and carried our Earth Day flag. “Go runners, go!” Some guests setting off for their sunrise kayak cheered us on. I hope that more people will join next time. It’s nice to experience nature early in the morning: there’s a gentle embrace from the chilled air, dewdrops on the leaves, and birds and cicadas humming you a good morning. Plus it’s also a great way to get fit and feel refreshed. One of my not-so-hidden talents is clay sculpting so I decided to share this lovely activity with our guests by holding a clay workshop. 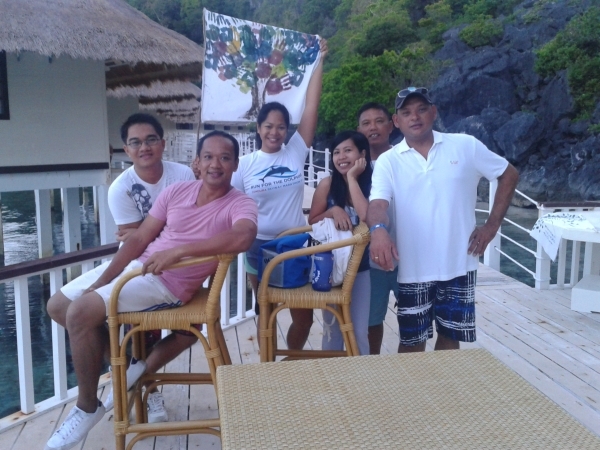 It was a great opportunity and a fun way for them to get to know the charming critters of Palawan. We made sea turtles, stork-billed kingfishers, and sea stars. They were so cute! 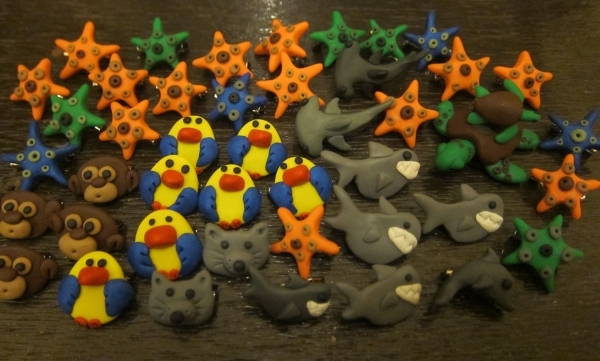 We baked the tiny sculptures and made them into brooches. Our guests got to take their little critters home too. No animal or plant was harmed nor taken out of its natural habitat by our wildlife-friendly trinkets! Our clay creations. Aren’t they cute? In the evening, we had a small get-together program at the bar. This was our pre-event party for the big event tomorrow! Everyone got a free round of cocktails and some nibbles. I showed some underwater footage from some of our dive sites. I wanted the guests to see how beautiful our environment is and inspire them to make a stand for Mother Earth. Once they realize what precious treasures we have here, they’d want to take care of it and make sure that the beauty of the natural environment will last for generations to come. This is it, our big day! I was a bit worried because I woke up to a very bleak morning. It was drizzling and the sky was overcast. I even texted Macy about it and she said it was the same weather in El Nido. But she said not to worry: we can still push through with our activities. Rain or shine, there’s no stopping us from cleaning up the Earth! 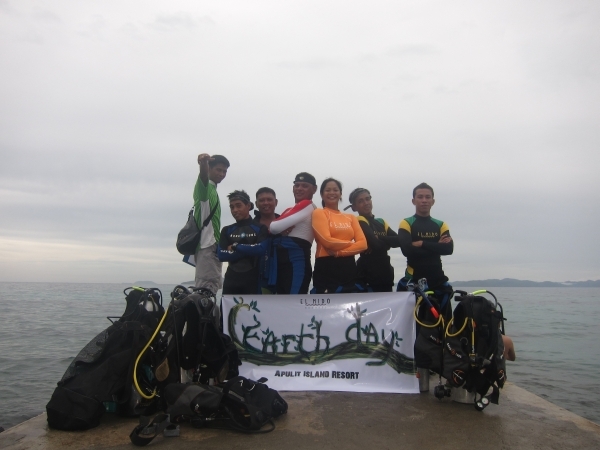 This was my first time to join an underwater clean up. I called us the SCUBA Rangers! We were a small team of six and I think we did a good job too. We swam from the front of Serena Pier up to the sandy area of West Beach, then back to the old Nirvana Restaurant. The water was so clear. I loved it! The water condition was really in sync with the SCUBA Rangers’ mission. We collected about 25 kilos of garbage underwater. We’ll definitely do more underwater cleanups in the coming months. The SCUBA Rangers are off to save the day! 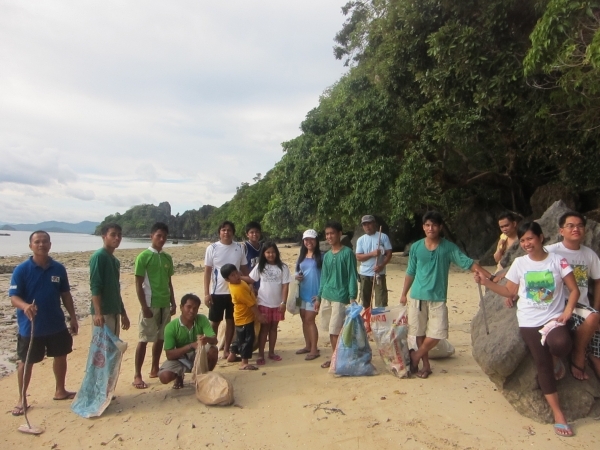 Coastal clean-ups are something we do fairly regularly in Apulit Island Resort, but I guess this one was slightly more special because members of the security team and rappelling contractors, as well as some guests also joined in! A grand total of 35 people helped out. We do our best to keep our island clean but garbage from other places drift along with the current and wash up on our shores. We are the ones who suffer from other people’s wrongdoings. Keeping the Earth clean and protecting our natural resources is everybody’s responsibility. That afternoon, picking up garbage on the beach became an enjoyable activity because of the good company around. We collected 85 kilos of garbage going from West Beach up to the beach in front of the resort. Well done team! After a hard day’s work, we all deserved to party! We shared simple snacks and played some games. I also gave out a special star pin as a souvenir for Earth Day 2012. My message to the participants: “You deserve a star for helping the environment!” I was very thankful to everyone who helped out and hoped that they wouldn’t tire of joining clean-up activities. We only have one planet Earth and what a beautiful planet it is. There’s no better time to start caring for it than now.